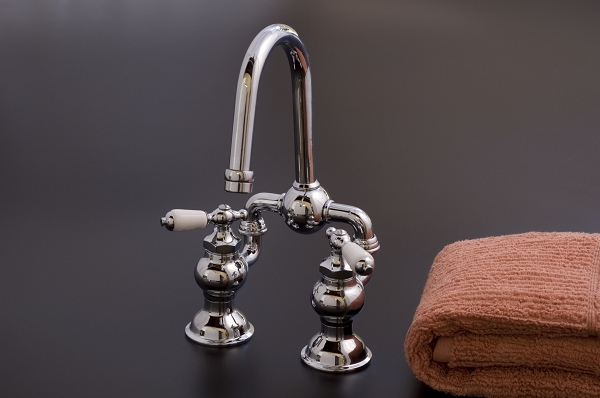 Adjustable Bridge Lavatory Faucet with Porcelain Lever Handles and Gooseneck Spout. Adjustable for 4 inch (shown) – 6 inch centers. (4 inch shown). Solid brass construction in choice of finish. Our Mac Select faucets are constructed with high quality, low lead brass and meet all current regulations with regard to lead composition. Features 1/4 turn ceramic valves, which consist of 2 ceramic disks that rotate to open and close the valve, minimizing mechanical wear. Available in Chrome, Lacquered Brass, Polished Nickel, Matte Nickel, and Oil Rubbed Bronze finish.